Teen Titans #16, written by Marv Wolfman with artwork by Tom Derenick and Trevor Scott, is the first comic following the Super Sons of Tomorrow arc which left the team in a rocky place. After their confrontation with Savior (a future Tim Drake, seeking to kill Superboy), they find that they haven't been working well as a team and struggle to trust one another. This distrust plays into their decision to not allow Superboy to join their ranks. Unfortunately this latest issue of Teen Titans doesn’t follow up on any of this, instead opts for a mundane one-shot. The story is solely focused on Starfire, but not in any meaningful way. Usually, a spoiler alert is called for, but, unfortunately, there’s nothing to spoil. 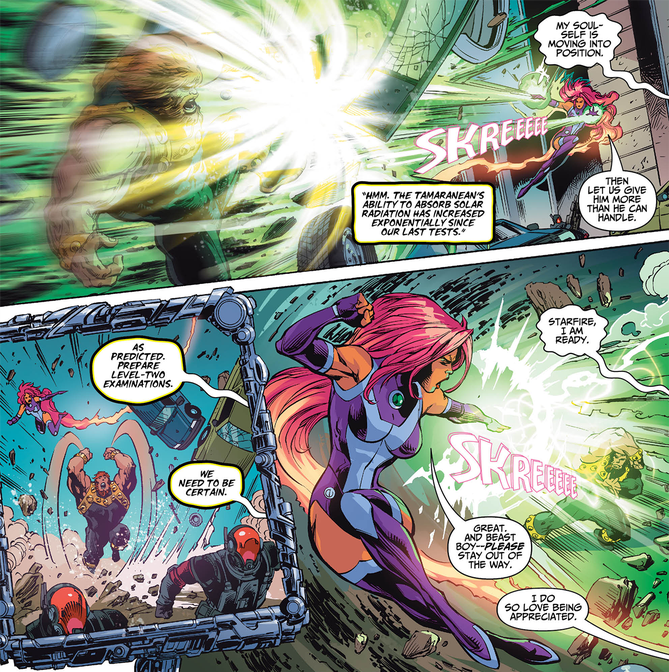 While fighting a villain alongside Beast Boy and Raven, Starfire is being watched and examined by an unseen force. After the confrontation Starfire becomes concerned when Beast Boy implies that she is too old to understand certain things. This really bothers Kory, going so far as to believe that they actually hate her. Meanwhile, citizens are being taken over by the same unseen force and are made to fight and detain Starfire. Captured and bound, Kory wakes up in the clutches of a reptilian, alien race that wants to study and experiment on her. She breaks free and fights her way out, having to also fight Beast Boy and Raven, who apparently were taken over off panel. Standard fighting ensues until the aliens are defeated and her teammates are freed of their mind control. After the battle Starfire asks Beast Boy why he and Raven dislike her. Of course, they don’t, Beast Boy simply wanted advice on his dating profile and didn’t think Starfire would be able to assist. Feeling better, Starfire smiles and flies off into the sunset. This is an underwhelming follow up to the previous crossover. What could have been an opportunity to embellish on the conflicted feelings of the Titans ends up being a completely forgettable experience with nothing to do with anything. There’s not really any character development with Starfire, if anything, kind of feels like a step backwards from her more commanding presence in previous issues. This is obviously a filler until the next big storyline but that doesn’t excuse a comic being so unremarkable. This is especially disappointing coming from Marv Wolfman who some would say defined the Teen Titans. Tom Derenick, Trevor Scott, and Jim Charalanmpidis helm the artwork as penciller, inker, colorist, respectively and its fine. It doesn’t distract from the storytelling nor does it enhance in any way. Hopefully moving forward the series will go back to using more unique styles as it did in the beginning with Khoi Pham and Jonboy Meyers. In the end this issue is inoffensive and uninteresting both in its writing and its art. If there’s any comic to skip this week, this is it.